What would you choose $2,000,000 today or doubling your money daily for 30 days starting with 1 penny? Think about it for a second…. The $2,000,000 glances at you at first sight versus the 1 penny offer. If you analyze it further you will see how the $2,000,000 will rob you from a bigger prize. A friend of mine asked me this and the analysis behind it was delightful. How a single penny can turn into something major if you compounding day after day or in such cases like capital investing years after years. What would you choose $2,000,000 today or doubling your money daily for 30 days starting with 1 penny? By the time you reach day 10 you have compounded $5.12. Wait, $5 only by now? If you continue, by day 20 you will have $5,242.88 but this is still far from 2 million dollars. 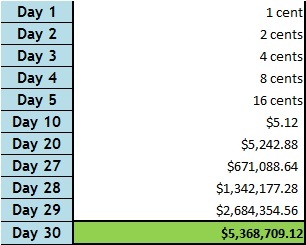 Towards day 27, 28 and 29 you will reach $671,088, $1,342,177 and $2,684,354. At this point, on day 29 the offer of $2 million would have been surpassed by a little over $650,000. The importance to highlight in all this is the power of compounding interest. If you allow capital gains to compound year after year you will receive a better deal rather than withdrawing your gains. The opposite relates to debt (credit cards, loans, etc. ), accumulation of debt is dangerous and if it carries interest on debt, could be disastrous. This is extremely important since most institution presents you with yearly interest rates, APR or performance tables without explaining the impact compounding interest rates have on your money. Now, you can consider this critical aspect when financial advisors and credit agencies among others, introduce you with financial instruments that carry interest rates. In the future we will talk further about investment performance and its comparison with other benchmarks and financial tools.